The portable projection screen Oxygon Tripod is perfect for a flexible use “on the road”. It is equipped with a sturdy tripod and the uncomplicated black steel construction makes it easy to set up every time anywhere. 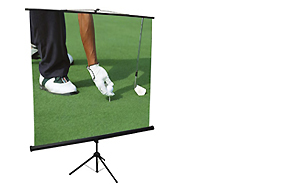 The matte white screen fabric without borders makes it appropriate for all projected picture formats. The light weight (7kg in size120x120 cm) is another advantage for easy transportation. Perfect for flexible use in all picture formats. Screen surface is easily cleaned with soap and water.